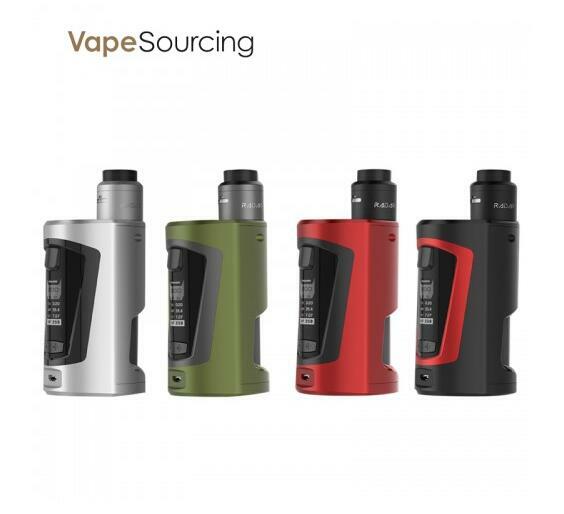 The Geekvape GBOX Squonk kit features dual 18650 batteries, 200 watts of power, a state-of-the-art AS chip, an 8ml capacity squonk bottle and versatile temperature control. If you get the full kit, you will also receive the 24mm Radar RDA that is built with a unique dual post deck, is compatible with single & dual builds, has a large juice well and features extreme user friendliness. The kit can be obtained in these colors: pearl chrome, army green, wine red and black/red. With measurements of 85mm x 55.4mm, the mod looks to be transportable and easy to store in your purse or pocket. At the top, there’s a spring-loaded 510 connection for easy and flush installs of your BF atomizer. On the front of the unit, there’s a large OLED display with a vertical menu. Vape data d display varies according to your current mode and may include wattage, two battery bars, coil resistance, amperage, voltage, puff number, TCR value and more. Dual batteries power the setup, are bottom loaded for easy installation and are stored behind a door that features an effortless, yet durable lock mechanism. Batteries can be charged via the micro USB port that supports passthrough vaping (vape while charging). The GBOX Squonk Mod is completely squonk ready thanks to a springloaded 510 BF squonk connector that is fed by a 8ml capacity juice bottle. On the technical level, the mod can operate in a myriad of modes thanks to the latest AS chip board. These include power mode, temperature control with nickel, temperature control with titanium, temperature control with stainless steel and a bypass mode for vape veterans. The resistance capability is also quite low at 0.05ohm in temperature mode and 0.10 ohm in power mode. The temperature range is the standard 200 to 600 degrees Fahrenheit range. If you get the GBOX Squonk kit, you will also receive the Radar RDA. It is constructed with stainless steel, measures 24mm in diameter and perfectly matches the mod’s color and finish. Built with a unique dual post deck, this RDA features single/dual coil compatibility, elevated gold plated posts, PEEK insulation and a deep juice well to prevent frequent dripping. Airflow is adjustable by rotating the top cap and can be widely changed to your liking. And, there’s a single coil airflow option for single builds. The Radar can be used with 510 and 810 drip tips. And, at the bottom of the device, there’s a gold plated BF pin for use with your favorite squonker. If you purchase the kit, you will receive the GBOX Squonk Mod, the Radar RDA, a GV Allen key, a spare squonke bottle, a Delrin drip tip, an accessories pack, a 510 drip tip adapter, a manual and a micro USB charging cable.